Denise Lorenz has an appetite for hot mustard. So much in fact that she decided to buy Susan’s Hot Mustard with her husband. They had enjoyed this product for years and were absolutely thrilled to become the new owners. Even though Denise was new to the industry and had no prior knowledge working in this sector, she had confidence in the product, as it had been manufactured and packaged at the same location for years. 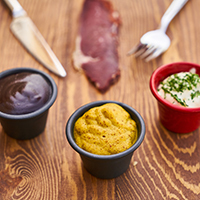 Susan’s Hot Mustard has been supplying hot mustard to customers since the 1970’s. Shortly afterwards, however, a manufacturing tragedy struck! The co-manufacturer of their hot mustard could no longer produce the product. 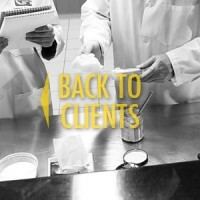 The issue for Denise was that the company she purchased did not have a copy of the mustard recipe on file, leaving Denise with a major challenge as the business owner. Duplicating the recipe from the remaining product they had on hand, translating it into something they could make themselves, and finding a new co-packer seemed an insurmountable task. Denise approached FIRSt to review the current formulation of the product and conceptualize new formulations, including the sourcing of alternative ingredients to replace in-house ingredients. The current products’ traits were identified and evaluated, and alternative ingredients and processes were suggested to achieve the original product that Denise initially fell in love with. Samples of Emily’s work were delivered to Denise’s door and the tasting process was simplified by the excellent evaluation forms, which led Denise visiting the tasting kitchen and meeting all the amazing, enthusiastic people behind the scenes. “Now we’re looking forward to stopping in to FIRSt with the final product, but of course, only for those who can handle the HEAT!” With her new product—after such a challenging start—it’s obvious that Denise did.